Today was our last day in the Rockies! Ryan wrote today’s post about Estes Park! Evan is our author for day 28. Today we did yet another big hike! These are the students who made it all the way to the summit of Halley’s Peak before the rain cloud come in! Today Vivian wrote about our first big hike in the Rockies! Today we finally made it to Rocky Mountain National Park!!! Sylvia wrote today’s post! Today was another drive day and Olivia S blogged about the day! Day 23 is written by Eve R.
Tofay was a big day because we separated our group into three different hikes. The student leadership team chose the hikes then the students got to choose what hike they wanted to participate in. This is Eve’s experience! Abby wrote today’s post for our time at Mt St Helens! Olivia M. is the author of today’s post. We had a hiking day and here is Olivia’s experiences! Andres wrote day 19 which was half travel day and half hiking day! Day 18 was our backpacking clean up day and Kate M was our author for today. Chloe wrote today’s post about the final day of back packing and her experience! Sean wrote day 16 about his experience backpacking the Ozette Coastline. Sophie’s blog post is about her individual experience on the first day of backpacking! Layne wrote today’s post about our prep for backpacking! Will J. is the authors of today’s blog about our hikes in the Hoh Rainforest in Olympic National Park! Today Sky wrote our journal! We are so excited that we got to see WHALES today!!!! Gwen wrote day 12 for the blog! We finally got to Olympic National Park!!!! 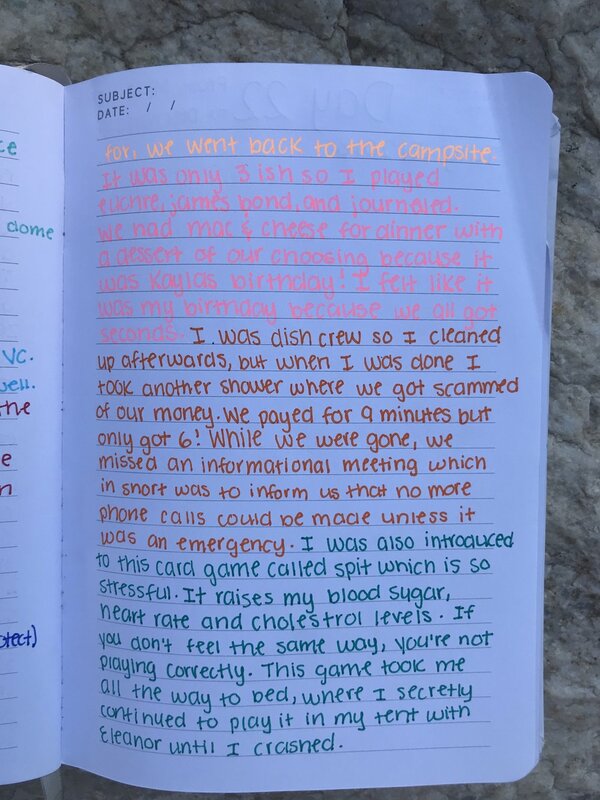 Alexis wrote today’s journal! We had a very busy day!